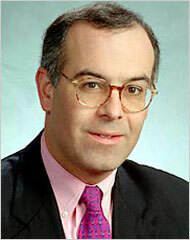 This webpage is dedicated to the neoconservative right-wing extremist PBS pundit David Brooks. He is a shill for the most extremist right-wing talking points. He is an apologist for the most unjustifiable Republican failures. He has argued against racial integration. He is not an American, he is a Candian so he could could less about the people of America; he just came to America to work as a right wing shill and get rich. PBS' NewHour has him paired with their other Republican shill Mark Shields (who passes for "liberal" on that show) in their "Analysis" part of each show. Dean Baker at Prospect.org has done extensive analysis of David Brooks. David Brooks Is Projecting His Self Indulgence Again in comments section "He is the master purveyor of false equivalency, using the voice of moderation to give the impression that he has fairly viewed the evidence and surely the ''conservative'' viewpoint best fills the bill. - Mark Jamison"